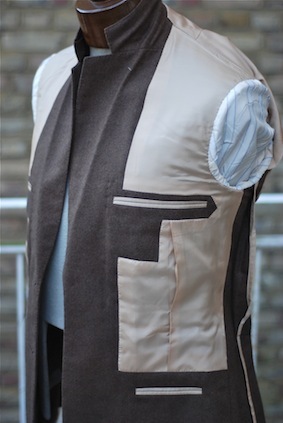 As mentioned in a previous post on this jacket, Graham Browne used the inspiration of my Rubinacci jacket to work on an alternative construction to the half-lined jacket. 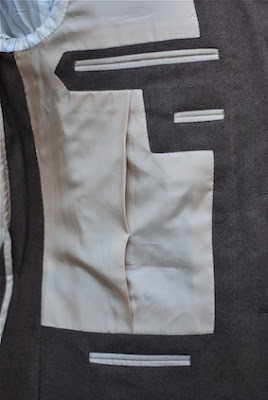 The same cloth (Harrison’s Moonbeam) is used in the internal lining of the front quarters, around the ticket pocket and inbreast pockets. Interestingly, although there is no pen pocket on the inside of the right forepart (above), the stepped lining is retained for the sake of consistency. 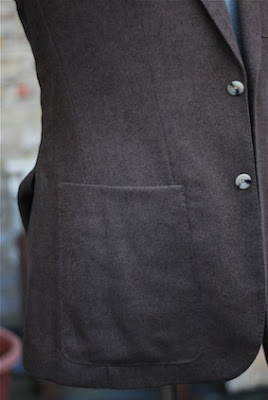 The patch pockets have more shape than some from English tailors, narrowing more towards the top and echoing the curve of the forepart, but the style is still less accentuated than on Neapolitan coats. You can follow the discussion on Graham Browne: Neapolitan lining by entering your email address in the box below. You will then receive an email every time a new comment is added. These will also contain a link to a page where you can stop the alerts, and remove all of your related data from the site. Simon, I’m having a difficult time with the last image. It would appear that the picture is of the jacket interior? I see three pockets: pocket, ticket pocket, and the third pocket which appears rather low. Quite too low in fact, it seems almost at waist level, which means the pocket dips below that? Or am I getting the dimensions wrong? Simon, another great post, thanks a lot. I tried to contact Graham Browne (thru their website) but had little success… I am trying to know if they do travel to the US as I live in NY. Do you know if they do? And would you have a contact info for them? I read your several posts about them and would be interested to try them out with a suit. Thanks a lot! Greg – that is the interior, yes, so you’re looking at the inbreast pocket, pen pocket and business card pocket. It is no lower than usual. Anonymous – I didn’t ask that the Rubinacci necessarily be copied, it was more that Russel is always interested in anything new I have made, and was interested in replicating it. Edouard – best just to call. GB don’t normally do US visits, but I know Paul or Richard were planning on coming to NY soon, so phone up and ask them. Italian tailors can always be counted on for interesting lining sewing. It’s interesting to see Graham Browne’s interpretation of the Rubinacci. Simon, you’re always very good about putting up nice, clear, high-res pictures and I thank you for that. Any chance you’d be able to snap some bigger pictures? I’d like to see this in more detail. do tbey charge extra for this work? Not at the moment, no. But it does take more time so I’d get in early before they have to. what kind of lining do you suggest for suits worn in warm climates?